Tumblr gained a lot of traction when it was first released. And it’s still used by popular sites such as The Industrialist. But according to Google Trends, it has been on a decline for the past five years. It’s only used by 0.1% of websites according to W3Techs, while WordPress is used by over 33% of the web. WordPress is an excellent option for bloggers due to the fact that it’s an easy platform to learn, there is a lot of support available, and you own your content. Not to mention the fact that you can do pretty much whatever you want to do with thousands of third-party plugins and themes. If you’ve been blogging on Tumblr for a while, you’ve probably built up a large blog archive. Don’t worry, you don’t have to lose any of your work as you transition to a more advanced blogging platform. 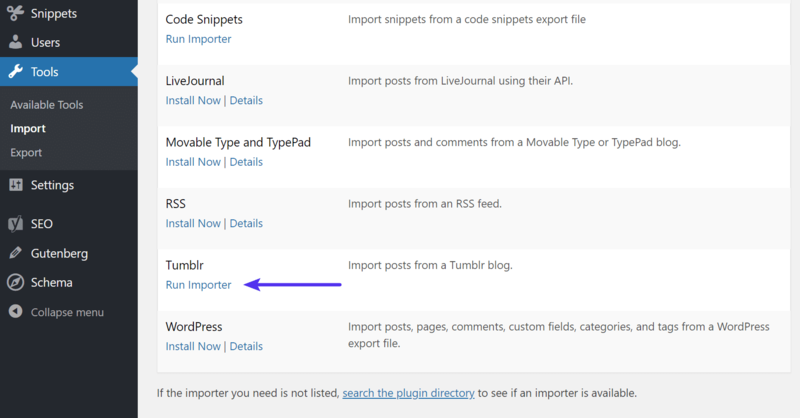 You can easily import Tumblr to WordPress. Importing is an easy process, usually only takes a few minutes, and you can start building your blog on your own platform. Here’s how to do just that, step by step. We always recommend taking a backup of your WordPress site before proceeding with any type of import job. This way you can easily roll back if there is a problem. 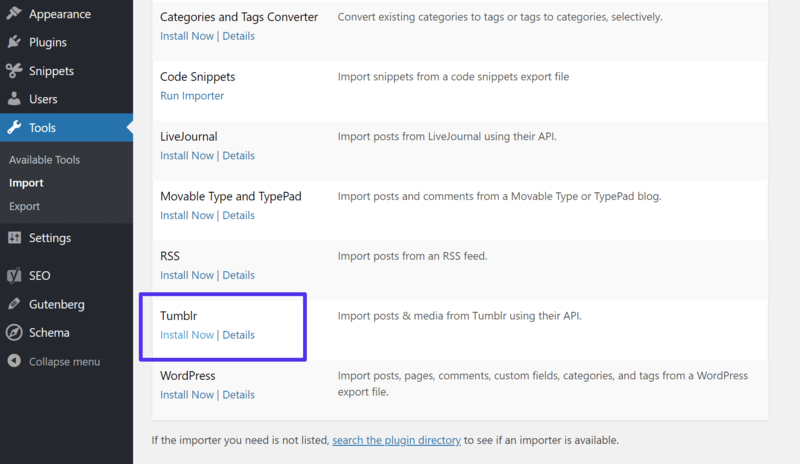 From the WordPress dashboard, go to Tools → Import. From that page, you have the option of importing several different platforms. Click on “Install Now” under the Tumblr option. This plugin is actually developed by the WordPress team and contributors. It imports posts, drafts, pages, and media (audio, video, and image posts). 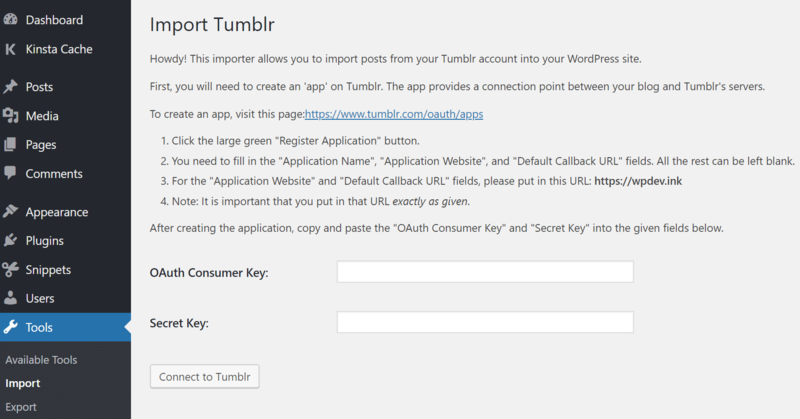 Before you can import your Tumblr blog, you have to create a Tumblr app to act as the connection point between your WordPress site and Tumblr’s servers. 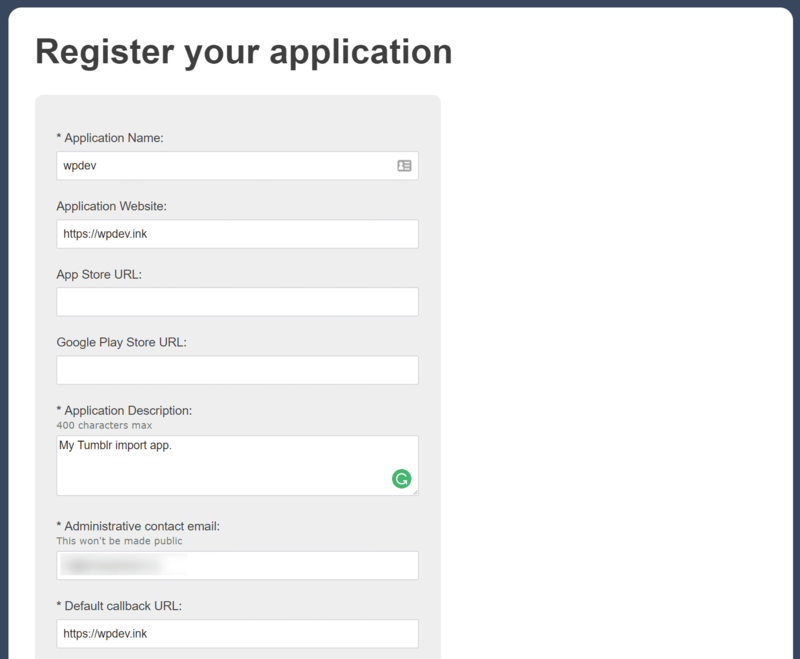 The Import Tumblr page will prompt you to visit the following URL: http://www.tumblr.com/oauth/apps. 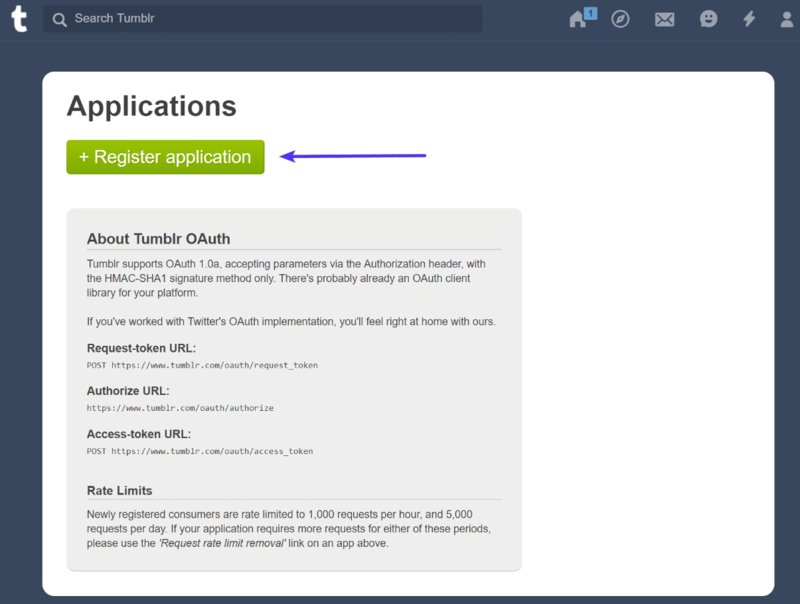 To create an application, go to your Tumblr Applications and hit the big green “Register application” button. The rest of the fields can be left blank. The instructions on the Import Tumblr page in the plugin will give you the URLs for both the application website and the default callback URL (typically just your full domain name). After filling in the info, click on Register at the bottom of the application. Note: Newly registered applications are rate limited to 1,000 requests per hour, and 5,000 requests per day. If your application requires more requests for either of these periods, you will be able to request a rate limit removal after completing the registration process. 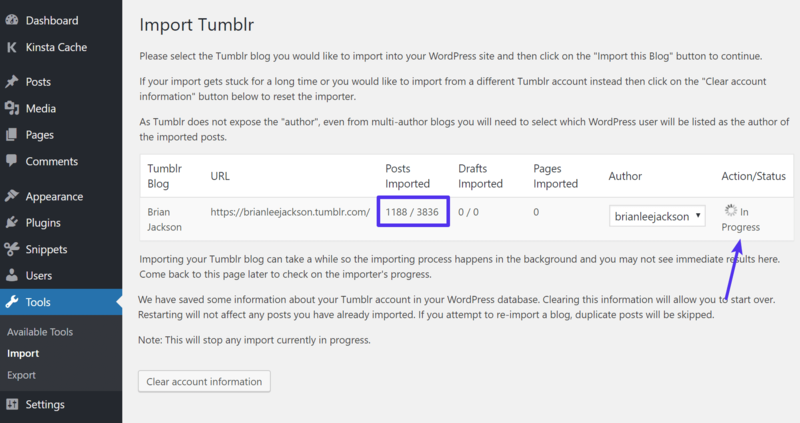 Importing your Tumblr blog can take a while depending on how large your archive is. 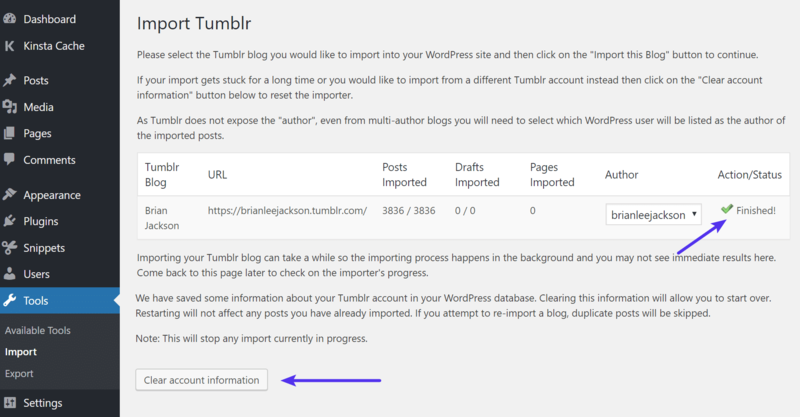 The importing process happens in the background so you can back to the “Import Tumblr” page to check on the importer’s progress. Once all your blog posts have been imported, they will be listed in your WP Admin → Posts dashboard. 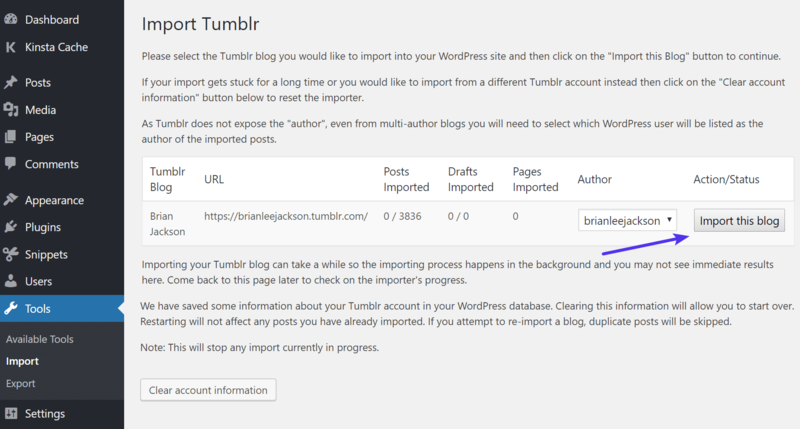 This will not affect any posts you may have already imported, but it does let you start over or import another blog. If you try to import the same blog, any duplicate posts will be skipped. And don’t forget about your SEO. If you changed domains our URLs, you’ll want to setup 301 redirects from Tumblr to WordPress. If you’re having any issues with the above method, or you need more advanced mapping options, we recommend checking out the premium Tumblr to WordPress migration plugin from CMS2CMS. These guys do nothing but migrations between various CMS platforms, so they’ve experienced just about every odd thing that could go wrong. Data mapping option which lets you choose what content to move. 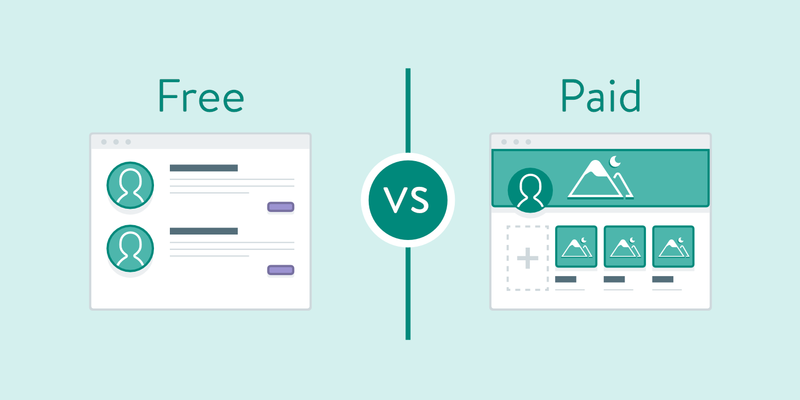 Migrates over pages, posts, attachments (images and videos), along with images included in the content body. You can utilize SEO friendly URLs. Migrate over keywords and metadata/meta descriptions. They will even setup 301 redirects from your existing Tumblr site to your new WordPress site. This is an important step in retaining your SEO link juice. Tumblr can be great for starting out, but once you get serious you’ll want a platform you can control. Check out these 10 additional reasons why you should use WordPress. Now that you’ve imported all your great Tumblr posts into your new self-hosted WordPress website, you can focus on building up your blog. You own the content and you control the site. Now go do something awesome with all that content from your Tumblr blog. Have any questions? Run into any issues importing your Tumblr blog? Let us know below in the comments. I followed all of these steps with the Tumblr to WordPress Importer. Unfortunately, it has only imported the TEXT from my Tumblr, and not the photos and videos. Do you have an answer for why that is? So sometimes the free plugin from WordPress doesn’t always import images correctly. Did you try the premium option at the bottom? They let you preview the migration beforehand. The premium option should definitely pick up more than the free version. Yes IFTTT is great! Although I think you might be referring to auto-posting? 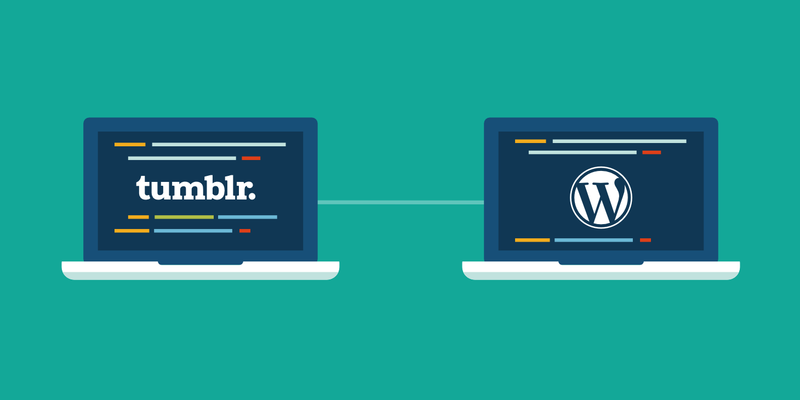 The tutorial is about migrating your entire Tumblr site over to WordPress in one fell swoop. Does anyone know if the notes (likes, comments etc.) transfer as well? Sorry if it’s a dumb question. Unfortunately, I don’t think likes or comments transfer over. I was able to import my blog and it imported all everything including text and videos but not one photo. This is unfortunate because I used it before and the photos came in fine. Any idea why? Hey Elise! This could be due to a number of different reasons. I would recommend trying the free CMS2CMS demo to see if it grabs all your data. If it does, their price for moving over the data from Tumblr to WordPress is very reasonable. I just want to say thank you! This was very helpful for someone who has relatively no blogging experience with Tumblr or WordPress, who is trying to help our company move from one platform to the other. Keep up the good work! I really want to do this, but I’m scared that I’ll lose my entire audience from Tumblr and be back to square one…When you import your Tumblr blog to WordPress does it just redirect your audience? 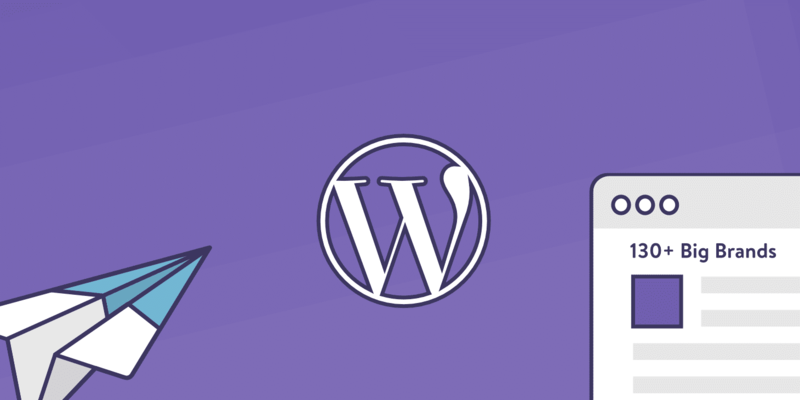 If you have any concerns about moving from Tumblr to WordPress, we highly recommend reaching out to a company like https://cms2cms.com/ who regularly does migrations like these. They should be able to help add 301 redirects (if possible) on the Tumblr side to your migrated WordPress site. I’ve been trying to import new posts from by tumblr, but it doesn’t work. Is there something I can do? Thank you!